So today, I have another fun little giveaway from Educational Insights for you! Smens Scented Pens! 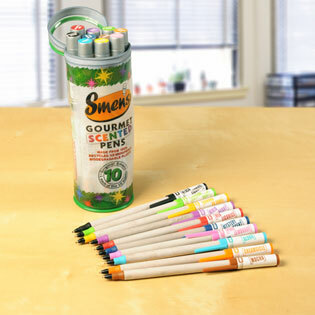 Smens are gourmet scented pens made from recycled newspapers. Available scents include Red Licorice, Creamsicle, Aloha, Mystery Scent, Banana Fo Fana, Mocha, Passion Fruit, Ninja Berry, Pink Lemonade, and Black Licorice. Each Smen is individually wrapped in a stay-fresh biodegradable plastic tube and is guaranteed to keep its scent for two years. The only complaint we had were that the pens are all black ink, my kids were hoping that they were colored according to their scent. We also received some colored pencils though and that seems to have made their color issues disappear. They use both all the time! I have to say that I love how the pens write. They’re nice and smooth and the ink flows out nicely, no clumping! And I can really tell that something’s a hit when I find the Teeny Tot trying it out for herself. She’s working on her older sister’s 3rd grade book below. Clearly she’s advanced for her age. Would you like to win a set of these yummy pens for your own group? I just happen to have a set to giveaway to one of you! Guaranteed to make learning more fun! And definitely more aromatic! Can’t wait? Click here to get your own Smens! To win a FREE set of Smens simply leave a comment below letting me know you could use some scented motivating tools to get your kids going this summer! The give away will be open until midnight EST Friday October 14, 2011. Winner will be announced by Sunday October 16, 2011. Make sure to leave a separate comment for each entry, winner will be chosen at random. This giveaway is offered to US & Canada residents only. Disclosure: I was provided with a free set of Smens to review on my blog. The opinions I have given are mine and may differ from others but were not influenced by the company or the free product provided. OH! We have wanted to try out Smens for a long time! Great giveaway! I think that my son would want to do his work more with a special set of scented pens. Smens would be a great addition to our homeschool supplies! Please count this as my entry for the scented pens…what a great idea! Oooo I’m so excited. These are on my wish list for things to use next fall with my preschooler. Yeah! how cool! My kiddos would love those. I had never heard of that before. I remember loving scratch & Sniff stickesr as a kid. These would be great!! I would love them!!! I could use these to motivate my daughter to learn to write her letters, numbers, and name! I’ve seen these and have been wanting to try them! We could def use something special to help motivate the kids. My kids have been wanting Smens. This would be a great motivator! Thanks! my little guys love to “smell” so these would be really fun!